I actually understand that last one, except for the "DD" thing. Eric!! 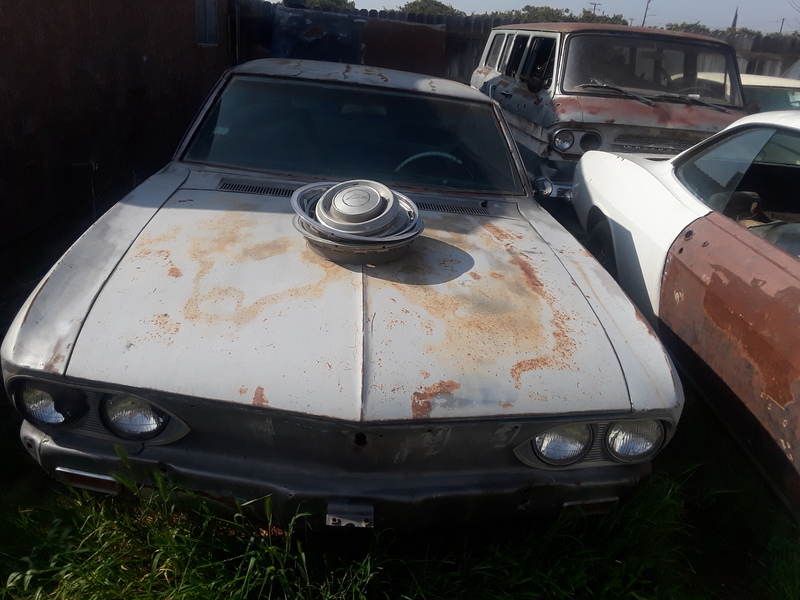 All info is in the FAQ's no "pro" needed..
you have a '66 Coupe.... has the stiffeners for shoulder belts [ hole punched at bottom of plate ]. 11,016th CAR to come off of the assy. line. 1,315th body built by Fisher plant. Your engine CASES at least, are '65 FC [ Greenbrier 110 hp with PG] Who knows what's inside! 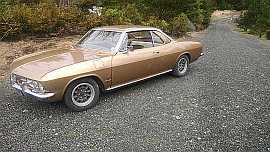 RX can also be a 1966 smog, PG, 140 ! I have one! Edited 1 time(s). Last edit at 01/12/2019 10:08PM by solo2r. It was made in the 4th week of February 1966 in Los Angeles. It was also originally painted Marina Blue (paint code F both upper and lower) and had a bright Blue interior (code 722). Yeah Matt, I knew the basics, but the engine block code is the special mystery. 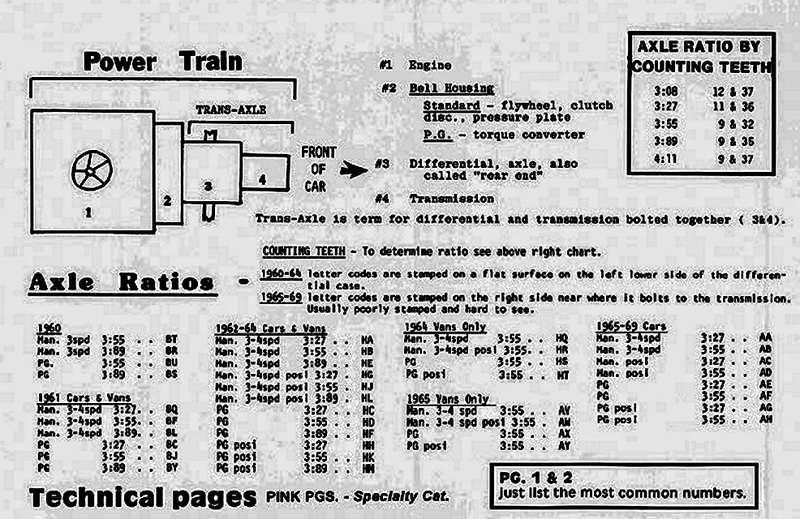 As has been pointed out, it is a code for a 1965 110 PG...or maybe a 1966 140...? I guess it could be either one, as it was an early year build--my special guess is February 22, 1966. The fact that I'm driving a 180 Turbo 4-speed stick just adds to the mystery. I was aware of the color codes--I think it's a special piece of Kismet that when I undertook to paint it away from the purple and black of the previous owner, my color choices matched the original, and I hadn't decoded the body tag yet! Edited 1 time(s). Last edit at 01/12/2019 10:57PM by playerpage. 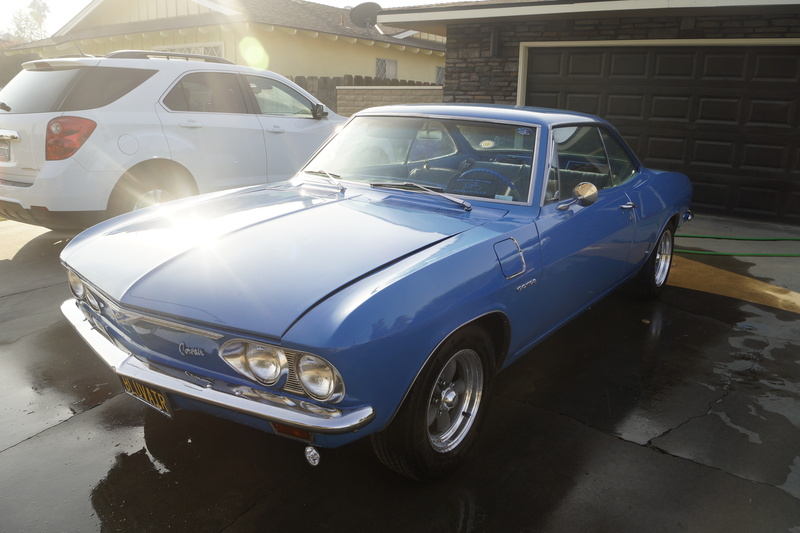 Your 1966 Corsa Coupe was the 1351st Built by Van Nuys (LOS angeles) Fisher Body Corporation before being sent "thru the wall" to Chevrolet Plant for completion. That code (40) was there because Fisher Body had to install a lower rear valence panel with the cut-out for the Turbo exhaust pipe. 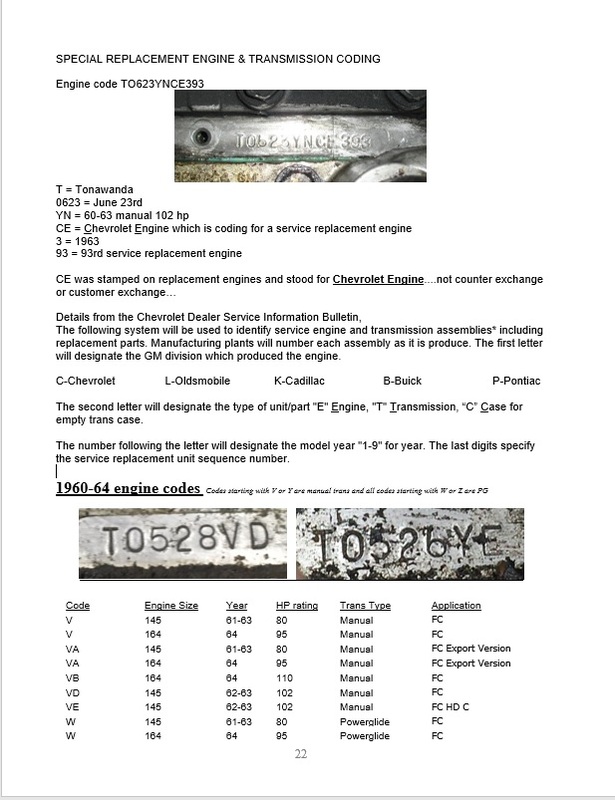 Your T0924 engine is either built in September (09) of 1964 with the provision for a rear access dipstick/oil fill tube for installation into a 1965 model year Greenbrier (all were built in Sept (or so) of 1964 in St. Louis, MO. OR the engine was built in September of 1965 for installation into a Monza or 500 series car with the PowerGlide Automatic transmission and A.I.R. Edited 1 time(s). Last edit at 01/13/2019 12:49AM by 1966-Corsa-GT-180. For warranty use, the dealer was supposed to stamp date when the car was delivered to buyer. Many times this feature was not used. ....and the -Z behind your trim id of 722 means the car did NOT have factory headrests on the front buckets. If it had a -Y behind the trim code, it would mean factory installed headrests on the front buckets. > > the "DD" thing. > times this feature was not used. I never knew what the DD was for, and none of the twelve I've owned was stamped with the delivery date. 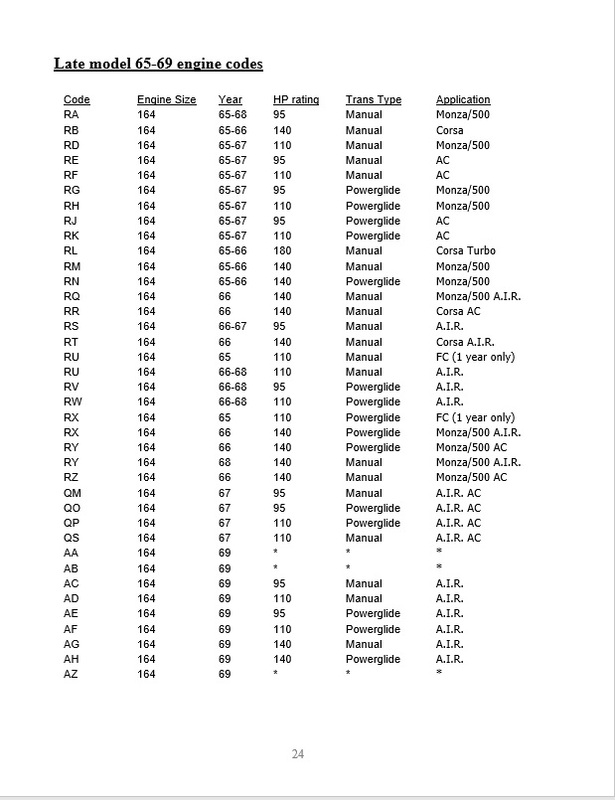 Where is anyone getting RX as 110 FC engine code? 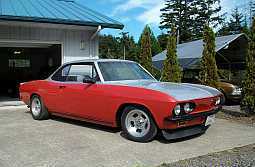 I only have RX listed as 1966 140 w/ smog Powerglide for Monza or 500. I did notice that on my list I only list a WB as a 64 FC 110 powerglide and I have no notes for a 65 FC 110PG or any 65 FC engines? Clark's Catalog Page 1 lists it as such. I'm getting "it" right off page 7 of the second addition of the junkyard primer. hmmm... I didn't have either of these listed in my notes. Snipped straight from Clark's catalog. Thanks to Clark's for all their handy info. I have these stored in my picture thumb drive. Pages 24 and 25 have a complete list of all the codes. Bob's daughter Becky is keeping his books available. You will soon be able to order them online via CORSA Merchandise and our Corvair Museum online Gift Shop. An announcement will be made soon! I condensed all the data I ever seemed to need down into 1 document and update it with any omissions, errors, or other relevant points. I own at least 1 copy of every Corvair publication ever produced but sometimes trying to find something and remembering what book it is in can be a pain. My "data" file is over 300 pages and keeps all stuff in a nice single archive. 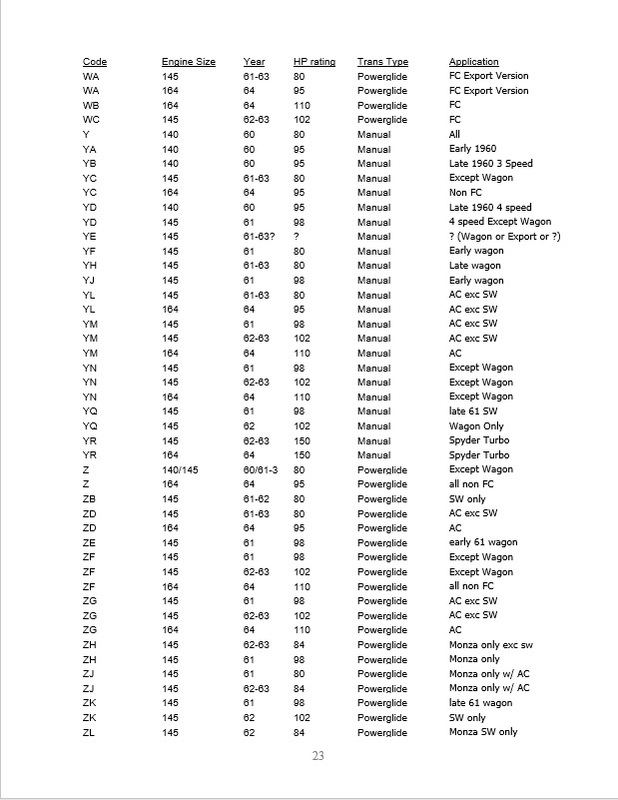 So if I'm reading the preceding chart correctly, my engine was most likely a 1966 140, but earmarked for a 500 or Monza...? So that would mean somewhere along the lines the heads were changed to accommodate the turbo? The whole thing would seem to have been installed later, seeing as I'm driving a Corsa. Now that I know where to look, I guess I'll check those head numbers too. Coming back to this, are we sure if the Corsa I have was or wasn't a stock Turbo? 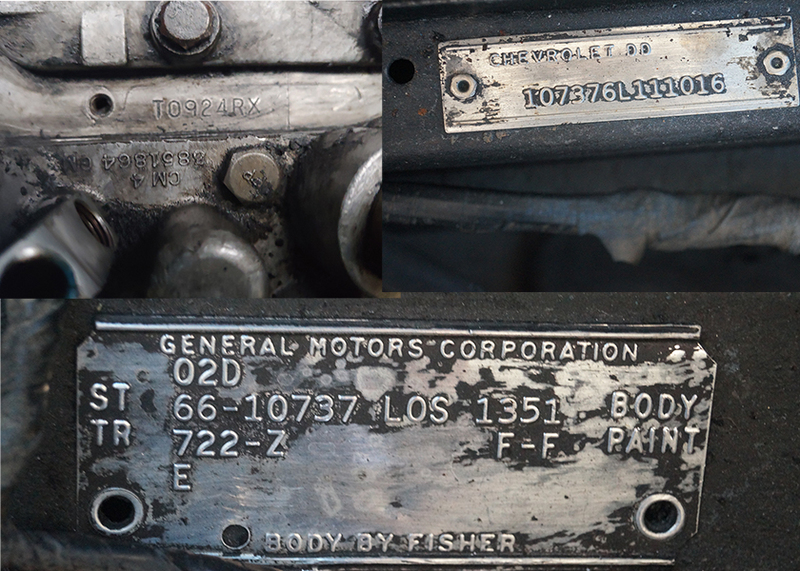 Dan Davis (1966-Corsa-GT-180) stated the body tag should have had a "40" on it which "equals" RPO L87. Does that mean RPO L87 should be on the tag? Or both "RPO L87" AND "40," or either one is good? Isn't it possible to have neither and have a turbo? The 'Corvair Basics' book says (on page 4) that turbos were "sometimes" identified by L87, which implies that sometimes they weren't. As a side note, where exactly will the RPO be printed if not on the body tag? Dan also said the 40/RPO L87 was there to tell Fisher to install the special panels for the turbo exhaust. If I have that does it mean it was originally a turbo? We know that my 1966 engine had the California smog AIR feature, but that AIR "wasn't required" on a turbo in California car. This statement again implies that it could have been installed if the owner requested it. And my heads are definitely Turbo. But Matt did say that if the case is stamped one way it's still a toss-up as to what's going on inside. You can see I'm still full of questions.